Dishwasher detergent for toilets and tubs: Automatic dishwasher detergent can get rid of stains in your bathroom. Sprinkle a few tablespoons into the toilet bowl, allow it to sit for a few minutes, and scrub the stains away with a toilet brush. For the tub: Get rid of bathtub stains by pouring about one-quarter cup of powdered dishwasher detergent into a plastic or glass container. Add just enough water to make a thick paste, and apply the solution directly to the stained area with a clean rag or sponge. Gently scrub the paste into the stain, and allow it to stand for about 20 minutes. Rinse your tub well with warm water, and buff dry with a soft, clean cloth. 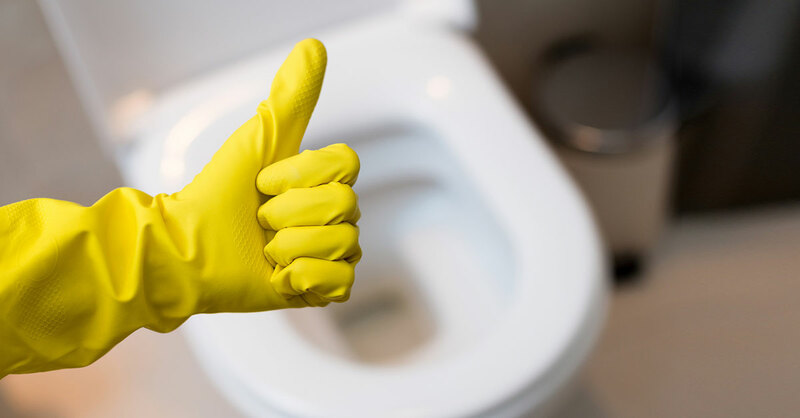 Fizzy cleaners for toilet stains: Toss a few Alka-Seltzer or denture-cleansing tablets into the toilet bowl. Once the fizzing stops, scrub the stains with a brush and flush. Coke makes a brighter bowl: Don’t throw out that flat cola! Every now and then, pour two cups (or more) of cola—flat or fizzy, regular or diet—into the bowl. Let it stay there for an hour or so, then flush and notice how the porcelain sparkles. Fresh and minty: If you have some leftover mouthwash and your bathroom smells a little dank, empty it in your toilet. It’ll disinfect the bowl and freshen the air. Newspaper for chrome and mirrors: Polish faucets and other metal items (particularly chrome-trimmed glass fixtures or furniture) with plain newspaper. Newspaper ink is a terrific polishing agent that requires no water or liquid, so just crumple a piece of newspaper and rub. And while you have that wadded up newspaper, clean your mirrors, too. Pen cleans out the grout: Here’s a neater way to clean grout around your shower tile—use a bleach pen, such as the one sold by Clorox, to trace light or white grout lines without getting bleach all over your tiles. Wait 10 minutes and rinse. You may need two tries to get really mildewed grout clean. Be sure to run the bathroom fan, and avoid contact with skin (rubber gloves would be good here). Homemade grout bleacher: Don’t have a store-bought bleach pen? You can make your own, or a facsimile…by mixing baking soda and a few drops of bleach (be sure to work in a well-ventilated area) until you create a paste slightly thicker than pancake batter. Plaster the moldy grout with this mixture (use an old paint brush or gloved fingers). Let sit until dry (several hours, at least) and wipe away. Your grout should be sparkling white without a lot of scrubbing. Thanks to Linda Cobb, author of Talking Dirty with the Queen of Clean (QueenofClean.com); Family Handyman (FamilyHandyman.com) and Julie Edelman, author of The Accidental Housewife: How to Overcome Housekeeping Hysteria One Task at a Time (JuliesTips.com) for help with these tips.